you have done it to me". 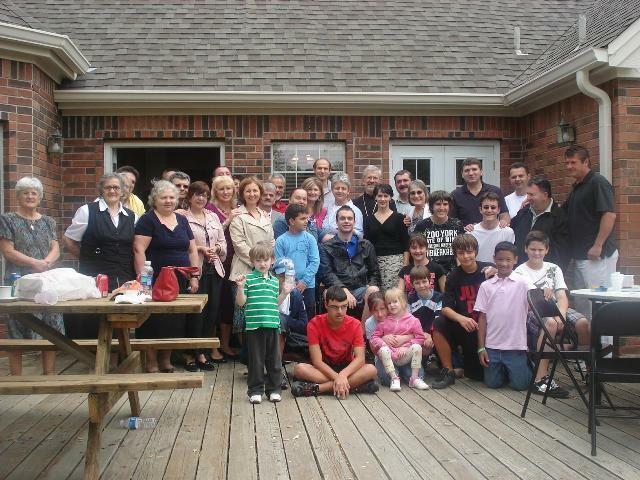 On March 27, 2011, the third Sunday of Great Lent, St. Luke Missionary Parish of the Serbian Orthodox Church in Austin, Texas has organized a humanitarian banquet, a fund-raising for a 21 year-old Igor Petreski, who in the summer of 2010, has suffered a major bodily injury. As our honored guest, Igor and his parents, Sonja and Zvonko Petreski, have come to the Divine Liturgy at our church property in Leander, Texas. After the service, we had a tasty Lenten lunch and a nice chat with our honored guests. Each parish member, in presence or absentia, donated money they could afford for the family in need. Our priest, Proto Drago Popovich, gave a short sermon on charity to our parishioners, welcomed our guests and on behalf of our church and parish members, presented Igor and his parents with the gift - a check of $5,400. Our guests’ eyes watered with surprise and appreciation. Parish members also had a hard time hiding their ears of joy, sadness and also pride. As a small, still growing and financially modest parish, we have shown that working together and in unison, we could make a difference and make a donation for a great cause. In addition, we have set an example on how we are able to make a positive impact for the Austin community and beyond. PS - If you have not already donated for Igor but would like to, please send your donation to our Holy Apostle and Evangelist Luke (on the memo line please write that the donation is for Igor) and we will gladly pass it on to Igor and his family.